Amazon.com Gift Cards are redeemable toward millions of items at Amazon.com, have no fees, and never, ever expire. Amazon.com Gift Cards can be purchased in almost any amount, from $0.15 to $2,000. Your recipient can spend their gift card right away or deposit it into their Amazon account and wait for that sale of a lifetime. Any gift card balance left over will stay in their account for future use. Amazon.com Gift Cards can be delivered several ways. Send a gift card by e-mail, post one on a friend’s Facebook timeline, print your own gift card at work or home to deliver in person, or order an Amazon.com Gift Card by mail with FREE One-Day Shipping. Physical gift cards are accompanied by a free greeting card or a free gift box in a variety of designs, perfect for any gifting occasion. 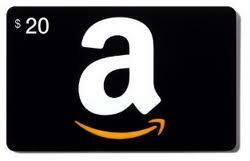 Amazon.com Gift Cards are also available in bulk, great for stocking stuffers or on-the-go gifts. Electronic Amazon.com Gift Cards can be purchased for immediate delivery or scheduled up to a year in advance by e-mail or Facebook, so you never miss an important date. Need a last-minute gift? Print an Amazon.com Gift Card from your home or office computer instantly, or drop by your local supermarket, drug, or convenience store that sells Amazon.com Gift Cards. You also can add an Amazon Gift Card to your Wish List, or Baby Registry or Wedding Registry to help friends and family buy you exactly what you want. Gift cards or gift certificates used to be considered an impersonal, “I didn’t know what to get you” gift ...no longer. Each gift card can be sent with a personal message. We have hundreds of designs to make any recipient smile--something for every occasion: birthday presents, Thank You gifts, wedding or housewarming gifts, gift cards to say Happy Anniversary or Happy Valentine’s Day, baby shower gifts, retirement gifts, graduation presents, gift cards to give Mom or Dad for Mother’s Day or Father’s Day presents, and of course a variety of gift card designs for the holidays. Amazon has a gift card for every type of personality, too: for bookworms, music aficionados, gamers, foodies, fashionistas, techies, do-it-yourselfers, pet-lovers, shoe-lovers and more. Looking for something more personal? Make your Amazon.com Gift Card move with our selection of animated gift cards, available to send via e-mail and Facebook. Or, create a JibJab Video Gift Card Starring You that features you and your friends' and family members' faces. Or, use your own photo on an Amazon Gift Card for the ultimate personal touch. Perhaps you have a specific gift in mind, but you're not sure of the exact color, size model, etc.? Use our eGift an Item feature and e-mail a gift card suggesting something for them to buy with it. The recipient can redeem it for that item, or use their gift card toward millions of other items so you can give without guessing. All Amazon.com Gift Cards are redeemable store-wide so no matter which design you choose, they’ll be able to pick the perfect present. Amazon.com has a gift card for everyone, and for any occasion.